In spite of what the title may suggest My Age of Anxiety is not precisely a memoir. If expecting a poignant, funny account of Mr. Scott Stossel’s life filled with hope and redemption, then expect to be disappointed. 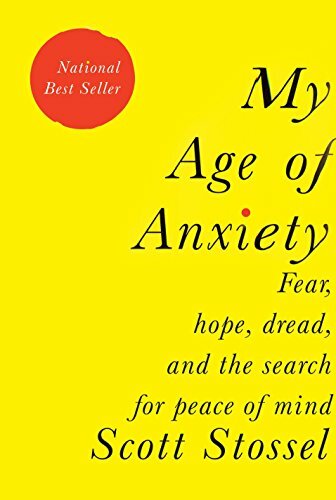 If looking for a well-written, impressively thorough history of anxiety in which Mr. Stossel has added just enough personality and personal information to make it all palatable, then look no further. Mr. Stossel appears to cite every paper, every researcher, every study concerning anxiety ever conducted in the history of the written word (way before it was called anxiety) within the 416 pages of this book. Impressive, as it is daunting. And this is where Mr. Stossel is to be commended for his bravery. Much of what he recounts does make him appear weak and ridiculous and just totally messed up. But it’s his vast intelligence, his successes, his fortitude, and his survival that shine through all the mess. Wading through Mr. Stossel’s detailed descriptions of his many phobias: claustrophobia, acrophobia, asthenophobia (fainting), agoraphobia, bacillophobia (germs), “cheese (no term for that one),” social phobia, aerophobia (flying), and a personal favorite: emetophobia—intense fear of vomiting, along with aeronausiphobia (vomiting on airplanes) is quite a chore. But Mr. Stossel does so with subtle humor and self-disparagement, making it just tolerable. In the end, Mr. Stossel offers no answers—for himself or for others suffering. But he does provide a huge body of knowledge and a thought-provoking look at the history of anxiety, eliciting empathy and understanding and respect for human suffering and spirit. Hopefully writing My Age of Anxiety proved to be cathartic for Mr. Stossel. Reading My Age of Anxiety will surely prove to be inspirational for his compatriots.